The configuration, update and management of Baruwa Enterprise Edition systems has been simplified and fully automated using the baruwa-setup utility. 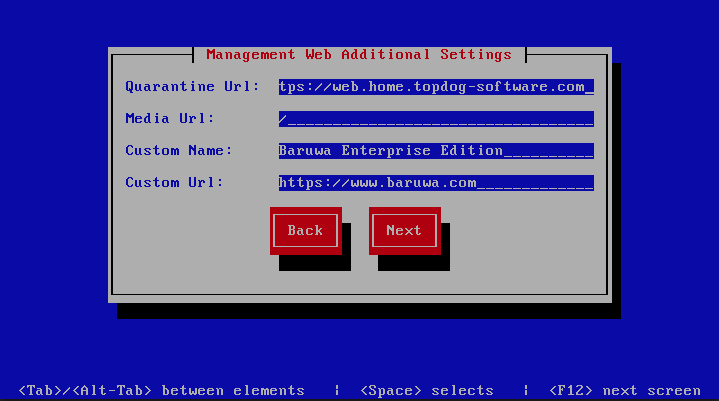 Baruwa Enterprise Edition >= 2.0.7 uses an automated wizard based utility called baruwa-setup to configure, update and manage the system. On the first run this utility collects configuration information from the user, performs any required software updates and then configures the system based on the profile selected and the configuration data collected. This simplifies the whole setup and management process so the user does not have to manually edit any configuration files. The baruwa-setup command is idempotent, meaning it safe to run multiple times and will only make changes if they are required. All future updates and configuration changes to the system should be done using the baruwa-setup command. 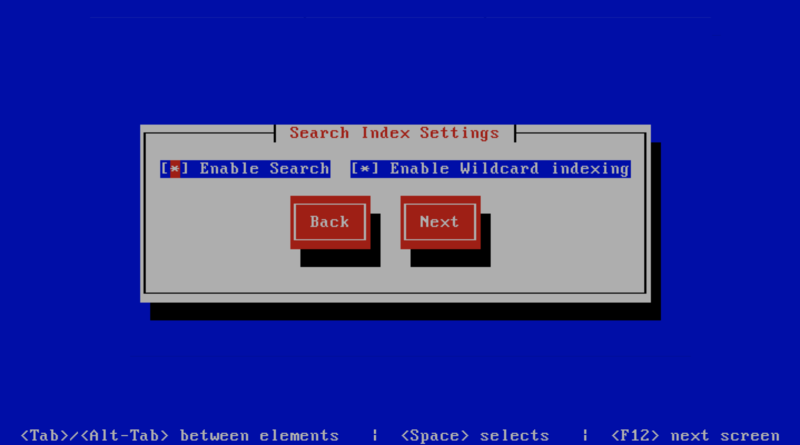 The utility has a man page that documents all the options available. A pass phrase is required to secure the authentication information that is collected. Make sure you choose a strong pass phrase which is easy for you to remember but difficult to guess for others, a long sentence describing a personal experience is a good pass phrase. 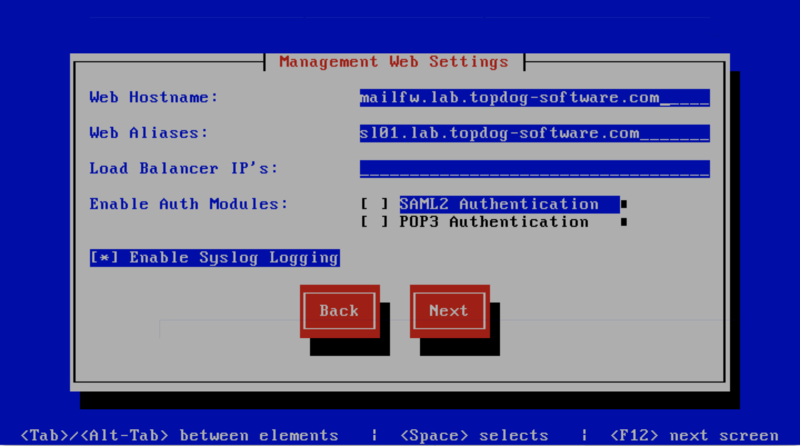 To start the configuration process login to the server with the username root and the password you set during installation. The program will ask you to set a passphrase, enter the passphrase and press enter re-enter the same passphrase again to confirm. 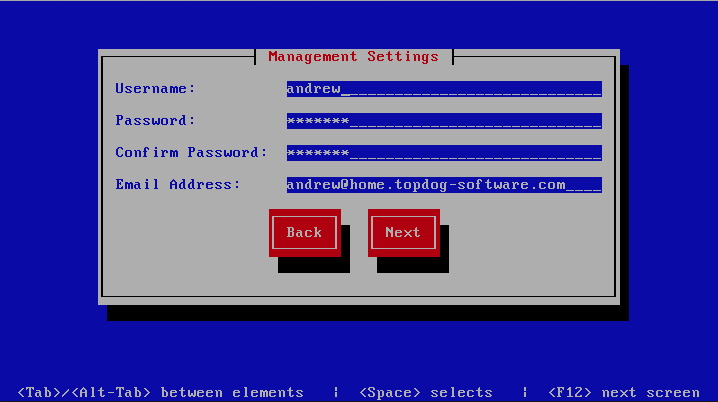 If the passphrase is accepted the System settings screen below will be displayed. Do not loose this passphrase, there is no way to recover it. A reinstallation will be required if you loose the passphrase. Timezone The system timezone, detected from the system configuration. several lines by including “n” sequences in the text. These will be replaced by line-breaks. RAM. Make sure you provision sufficient RAM. links, is overridden by domain settings. 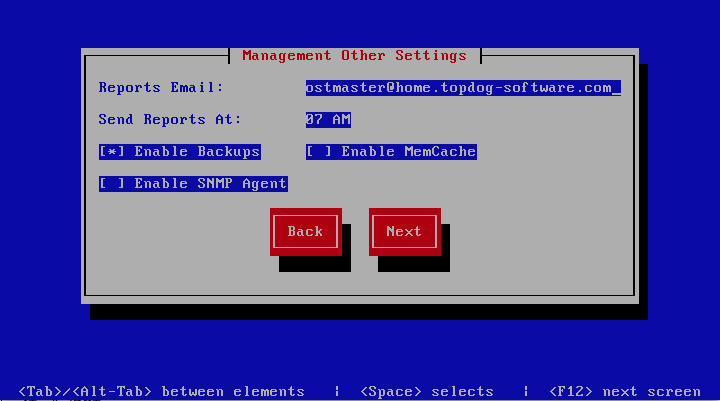 host, leave as default to serve of the same system. 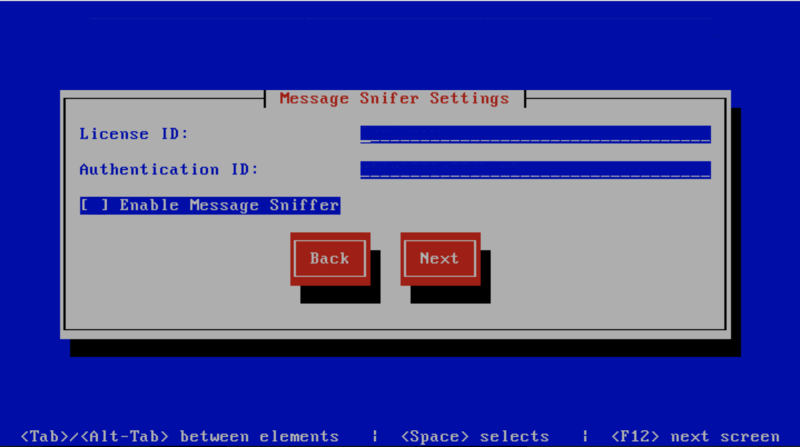 interface and email reports that are sent out. monitoring has not been enabled. will generate very large index files. not have reverse DNS records configured. 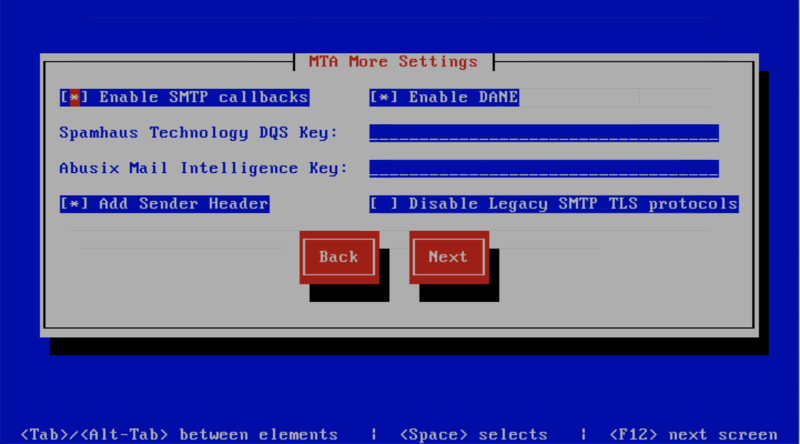 Enable the DANE protocol support. 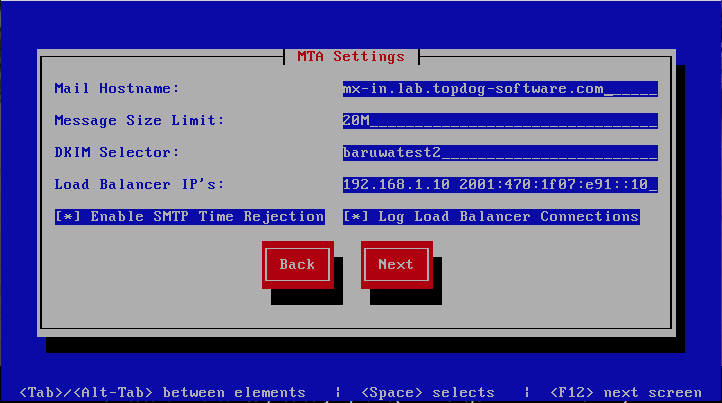 The Baruwa web interface MUST ran over SSL/TLS, other services such as SMTP AUTH only work over SSL/TLS as well. So you need to either purchase a valid SSL certificate or have baruwa-setup automatically request a CertBot certificate or generate a non recognised Builtin certificate for you. If you do not have a CA issued certificate and do not intend on purchasing one the leave the I have a CA issued Certificate unchecked. For the validation process to succeed, Certbot systems need to be able to connect to port 80 on your system, ensure that that is allowed on your network devices. Certbot certificates are only issued to systems of the Standalone System, Web and Mail System and Web Interface System profiles. Certbot certificates are issued only to the web hostname, web aliases and the mail hostname. Cluster members names are not included in the certificate. 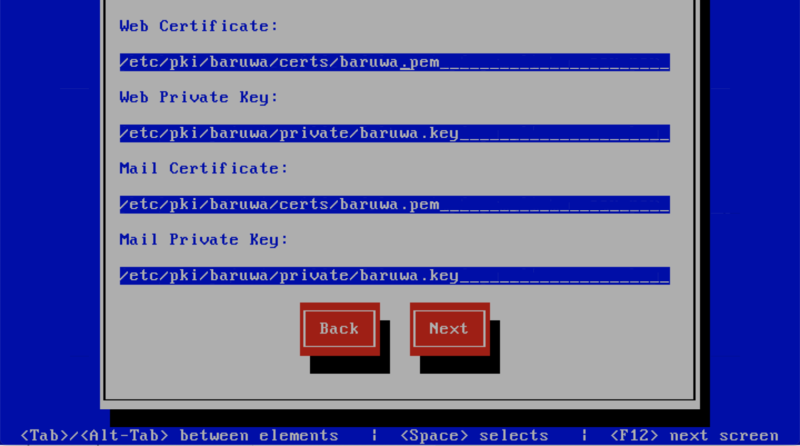 Support for CertBot certificates was added in BaruwaOS 6.8, refer to the ACME TLS Certificates section of the release notes for more information. It is currently not possible to issue or syncronize certificates in a cluster that uses the same hostname. If you are operating a cluster you should either purchase a Commercial CA issued certificate or use Builtin certificates. If you have a SSL certificate that is issued by a recognised CA and would like Baruwa to use it, install it prior to running baruwa-setup. Please NOTE that you need certificates that cover the web hostname and aliases, and the mail hostname. Please check I have a CA issued Certificate. 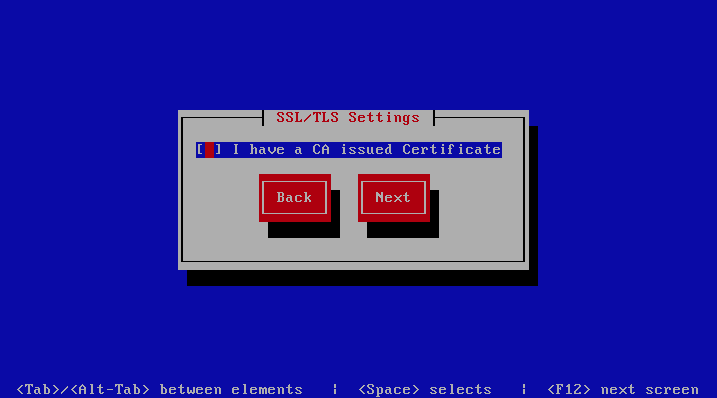 The preferred location to install certificates and keys on the server is under /etc/pki. You need to create a directory structure under that and store your certificate under it. If your SSL certificate is signed using an intermediate certificate, you need to append the intermediate certificate to the file /etc/pki/baruwa/certs/baruwa.pem. The server certificate must appear before the intermediate certificate in the combined file. You need to create additional certificate pairs if your web hostname and mail hostname are not the same. If you have a wildcard certificate with all your names being subdomains of that domain to which the certificate is issued then you can simply create one pair. The certificate that baruwa-setup generates contains all the relevant system names. The downside to the builtin certificates is that they are signed by the BaruwaCA meaning they will not be recognized by browsers and will generate unknown CA errors in browsers. 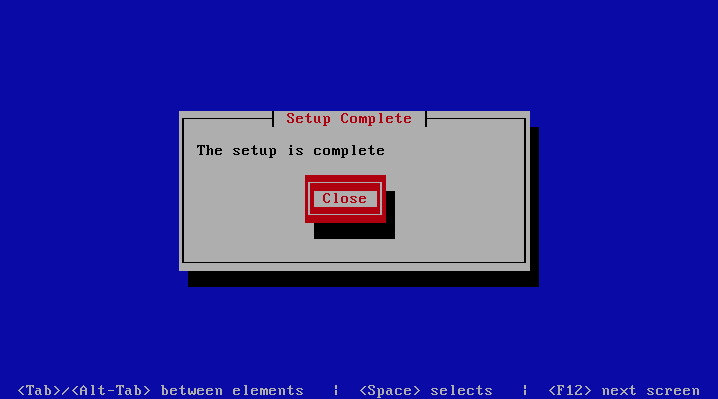 The baruwa-setup program will now ran the setup processes to configure the system. The processes include updating all the packages on the system. 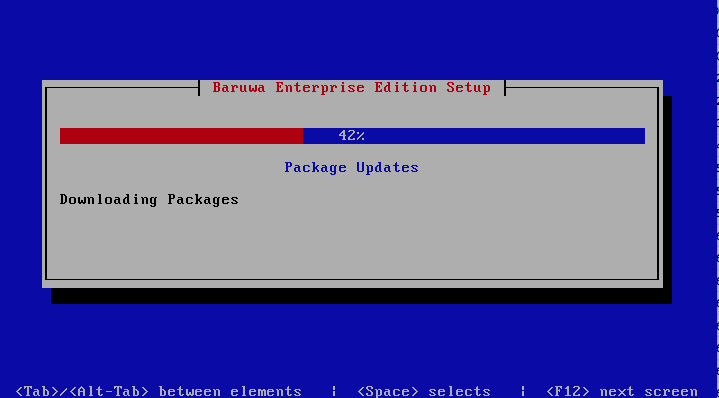 If a newer version of baruwa-setup is downloaded and installed, the process will reload the baruwa-setup command. When this happens a notification message with a 30 second countdown timer will be displayed and the baruwa-setup command will reload and display the initial (System Settings) screen. If this happens simply press the next button or the F12 key until you get to the Setup Running screen again. At this point there is nothing left for you to do until the setup is complete. 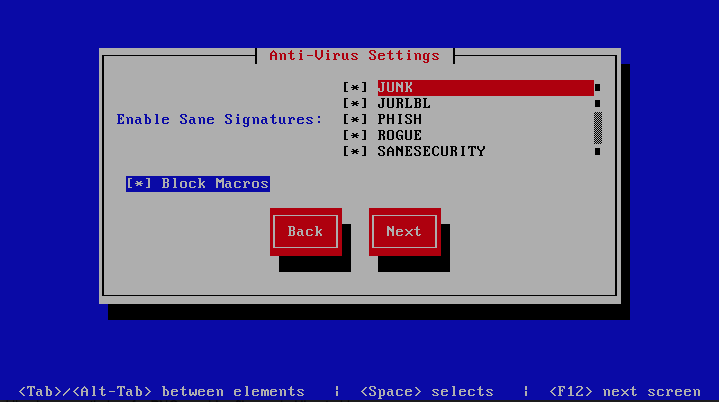 The program will update the screen with status information as well as logging it to /var/log/messages. If an error occurs the error information will be displayed until you press the enter button and the program will exit. If an error occurs while running setup, DO NOT REINSTALL the system copy the error and contact support. 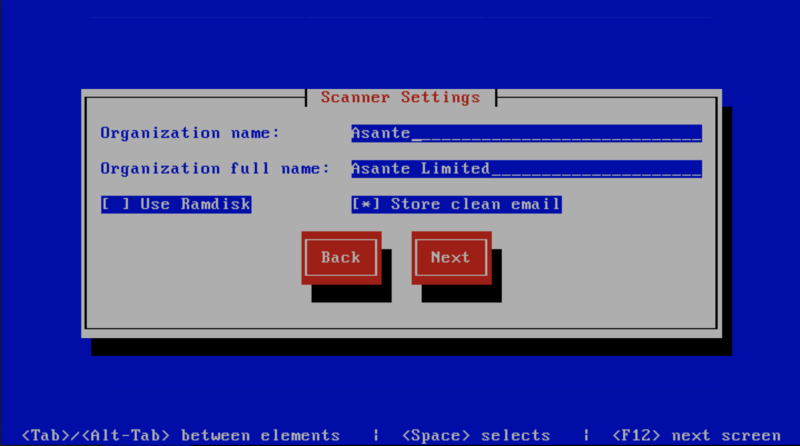 Now that the installation and setup are complete, you need to finalize the setup by Adding a Scanning Node, Adding an Organization, Adding a Domain and Adding an Account. This is done through the management web interface. Review the DNS, Administrators guide, Email Protection Best Practices and Advanced configuration sections for other configuration and setup options available.